Dwight is in big trouble. Daryl has escaped, and it seems that Dwight’s “former” and Negan’s “current” wife, Sherri, is missing. Dwight is taught a lesson in the form of a severe beating before being locked into the room that once held Daryl – and, it turns out, Dwight. Dwight insists that it wasn’t Sherri who let Daryl out, even though he found the note left for Daryl and recognized Sherri’s handwriting. Negan eventually lets Dwight out and tells him to go find Sherri and they will figure out what happened. Dwight goes out to the home he and Sherri once shared – they always promised to meet up there if they were ever separated. All he finds is a note from Sherri, and her wedding rings. In the note, she tells him that she decided to become Negan’s wife to save Dwight’s life, but it was Dwight who killed, and he became one of them. She accepts blame for her role in pushing him into that life, but being there isn’t better than being dead – it is worse. She hopes he gets away, and doesn’t want him to find her, unsure if he will kill her or turn her in. Dwight accepts this and returns to the Savior’s compound. He goes back to the infirmary for a check of his wounds, and tells the doctor that he killed Sherri. There were a bunch of the dead, and he pushed her into them. Meanwhile, Eugene has been brought into the compound. Laura takes him inside, and leads him to a room. Eugene is terrified, crying and begging for mercy. Then he freezes, unable to believe what he sees. A little apartment, well-appointed with a clean bed, books, and a kitchen. “Welcome home,” Laura tells him. She offers to get him food, anything he wants. He puts in an order, then tests the door when she leaves – there is a lock on the inside. The fridge is full of fruits, veggies, eggs, and beer. He has a stereo and TV. After he has eaten, Laura continues the tour. The majority of the people in the camp use a point system. “We eat good; they eat sh*t.” All he has to do is write what he took. “You want something, you take it.” She gives him a jar of fresh pickles and takes him outside to meet Negan. 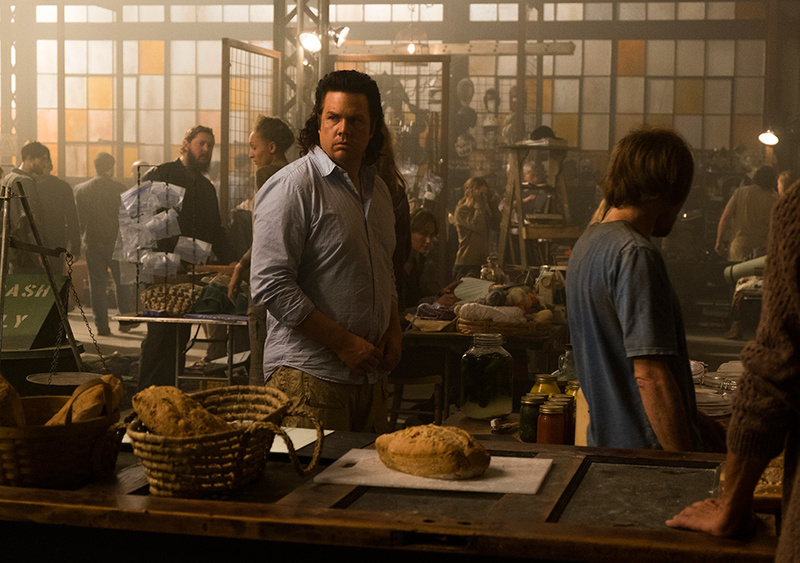 Eugene becomes terrified again, especially when Negan taunts him with Lucille. 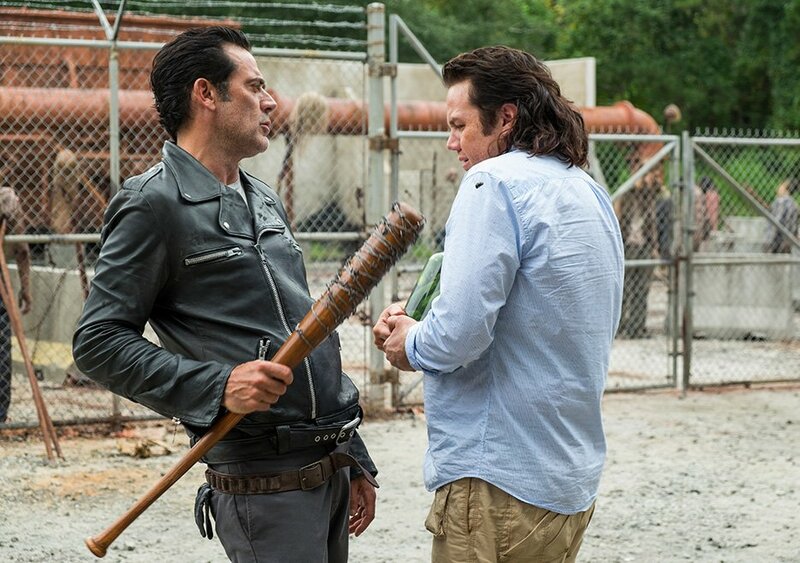 Negan asks him if he is a “smarty pants” and Eugene runs down his CV. 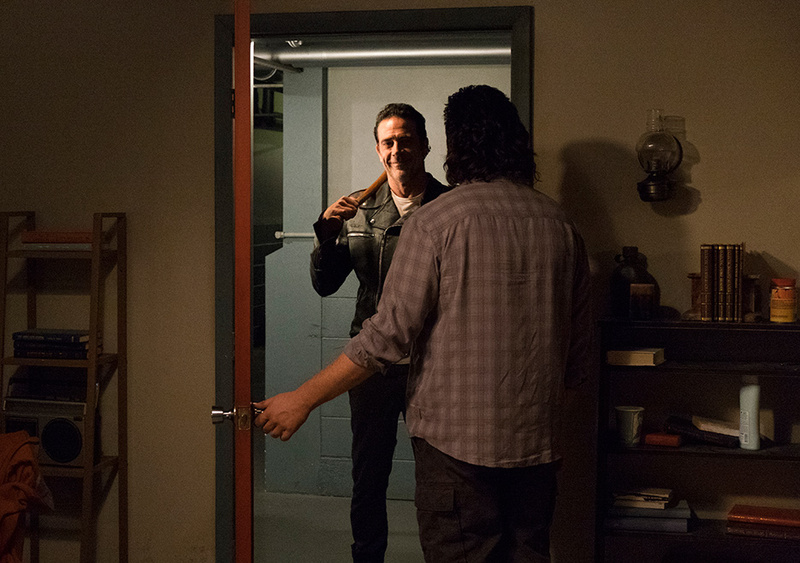 Negan has a quiz for Eugene: how does he prevent the walkers on the wall from falling apart? Eugene spews off an answer in seconds, talking about smelting some metal and pouring it over the walker and the fence. Negan is impressed and offers to send him a few of his wives to show him a good time. That night, Eugene is playing Atari while Tanya, Frankie, and Amber drink wine and eat popcorn. Eugene is nervous and rejects any sort of physical activity, knowing they are not here by choice. Tanya would settle for intelligent conversation and asks him about his work. When questioned, he admits he could easily build a bomb with the items in the room, and he takes them outside to do a couple explosive experiments for them. The girls are thrilled. Tanya and Frankie come back to Eugene the next night, looking for help. They chose this life, but Amber was forced into it to get her mom the medication she needed. She wants to kill herself, and Tanya and Frankie want Eugene to create some kind of pill that will take care of her quickly and painlessly. Eugene hems and haws but eventually agrees. He goes to the common area and waits in line at the “general store.” Impatient, Eugene tries to cut the line, only to be yelled at by the woman running the table. He heads back to the end of the line, but stops, remembering what Laura told him. He marches back up to the woman, asserts himself, and demands a cold capsule. The woman turns it over, shocked and offering a weak apology. He takes the pills, a bed pan, a spatula, a stuffed animal, then empties a box of medicine into his arms and storms off to make the pills. Laura takes Eugene to the smelting area, and sees dozens of followers are already gathered. They watch from the catwalk. When Negan walks in, everyone kneels. The doctor is front and center, and Negan hits him with Lucille. He found a note in his desk that said “Goodbye Honey,” in Sherri’s handwriting. Dwight clearly planted it, but Negan doesn’t know or care. He thinks that the doctor released Daryl so he could make a move on Sherri – who was obviously sweet on Daryl. 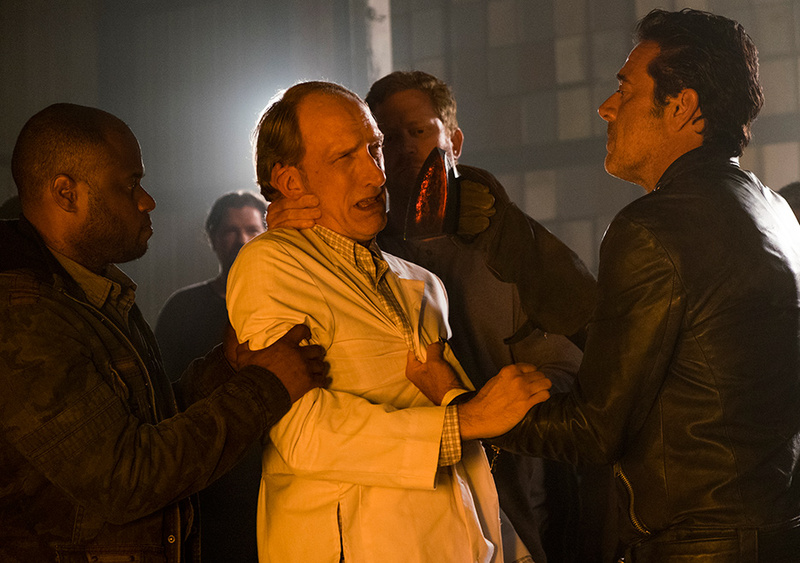 Dwight hands Negan the red-hot iron, and the doctor begs him not to. He admits he released Daryl, hoping it will save him. It does – but only for a moment. Negan drops the iron, then grabs the doctor and throws him into the smelter. Negan tries to commiserate with Dwight over Sherri’s death, but Dwight, playing the role to perfection, isn’t sorry. Frankie and Tanya return to see Eugene, who is back to the Atari. They are there for the pills, but he won’t give them over. Eugene knows the pills are for Negan, not Amber. The girls threaten to turn Eugene in if he doesn’t hand over the pills, but Eugene isn’t concerned. They are disposable to Negan; he is not. The girls leave, and soon after Negan pays him a visit. Eugene instantly tenses up. Frankie and Tonya have nothing but good things to say about Eugene, and he reassures him by promising Eugene need not be scared anymore – he just needs to answer one question. Eugene doesn’t hesitate. Before he is even asked, he assures him he is Negan. Eugene is adjusting frightfully well to the Saviors’ way of life. You can watch previews for the next episode of The Walking Dead by clicking here.